False Alarm - Don’t Panic? False Alarm – Don’t Panic? One comment that is often levelled at security companies is ‘why get an alarm when nobody pays attention to them going off all the time?’. It’s a fair question. 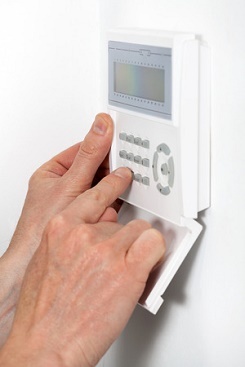 We do know from research conducted that burglars are deterred from breaking into homes that have an alarm however it’s also true that an alarm that constantly goes off will soon cease to grab anyone’s attention and will just become an annoyance. In short, the more times your alarm goes off without a valid reason, the less likely anyone is to respond if there is a genuine break in. Not only that, if your alarm is monitored or has a police response then this service may be withdrawn if you waste their time with false alarms. If your alarm goes off every time there’s a power cut it means the battery is dead. If it keeps going into fault mode there’s something that’s not quite right. These are things that can largely be prevented by having an annual service. Batteries will always be checked and replaced when necessary and often small issues can be resolved before they become faults. Are you sure you’re using the system properly? There are more functions than just ‘off’ and ‘on’ such as setting different zones for when you go to bed. Familiarise yourself with how the alarm works and which zones you’re able to set to prevent those ‘midnight snack’ wake up calls for the neighbours! When you enter the house you have a fixed period in which to deactivate the alarm and this is a key time for setting it off because you didn’t quite get there. If you find this happens a lot there are a couple of things you can do. You can either make your route to the panel simpler by always using the closest entrance, keeping the route clear of clutter and making sure your hands are free. If you find this doesn’t help you can always have the time delay reprogrammed to give you a little longer. You’ll find your neighbours will have a low tolerance for your alarm going off, especially if it happens during unsocial hours. Apart from the fact that it’s better not to have ill feeling between local residents, it also means that nobody will pay any attention should an intruder trigger it (and often burglars will know this and take advantage), in effect rendering it useless. Therefore the choice is have an alarm and look after it or don’t bother having one at all. Both will keep you sweet with the neighbours but only one will protect your home and belongings.